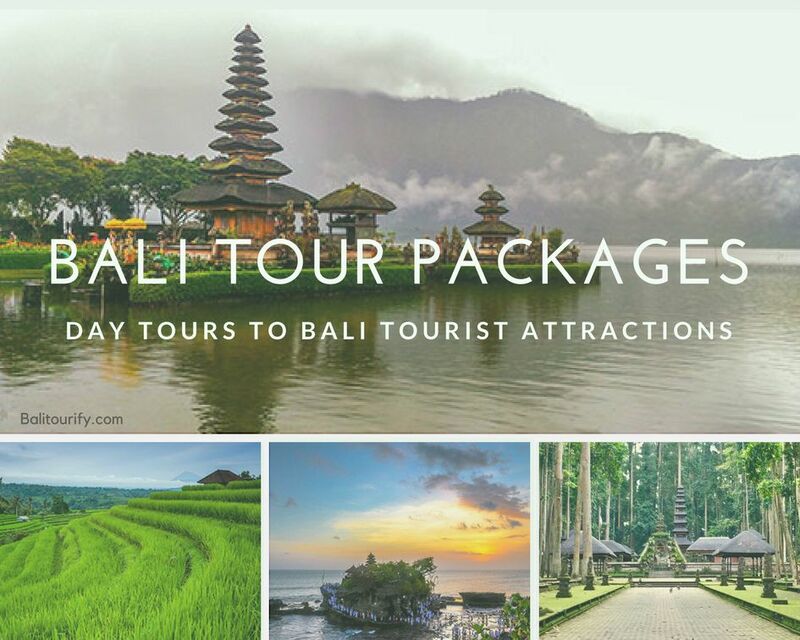 Bali Tours Package | Bali Tour Itinerary | Best Bali Day Trips, Would you like to experience the fabulous Bali rice terraces, beaches, waterfalls as well as the welcoming locals with their unique cultures? The Bali island provides all of it to complement your getaway with your family, friends or even for your honeymoon vacation. It is certainly not wrong that The paradise island of Bali has been awarded as the world's best tourist destination a few months ago by Tripadvisor. A visit to Bali island is a venture with a superb scenery of highlands and mountain hills which are enhanced by exotic tropical beaches along with the gorgeous seacoast. The island is likewise recognized for lovely rice terraces, archaeological & historical attractions and also an impressive tradition of pleasing Balinese people. There are numerous things which make the Island of Bali is a terrific travel destination for travelers to go to one or more times in a lifetime. It is assured that whenever people travel to Bali, Indonesia, they will surely return repeatedly. The province of Bali houses several towns that are classified as essential from either cultural as well as natural elements. For example, Kuta, it allures lots of surfers and also offers various shopping sites and enjoyable nightlife. Seminyak is recognized as a region which is quieter than the town of Kuta and provides nice beachside villas, hotels, restaurants, and bars. Various other best-known destinations of this Indonesian province are Nusa Dua, Candidasa, Canggu, Sanur, Bedugul, Lovina, Ubud, Denpasar, Tabanan, and Jimbaran. Bali Indonesia tour packages consist of almost all or most of those locations. Bali island offers lots of natural points of interest like Mount Batur and Lake Beratan. It also offers Furthermore historical sites such as Gunung Kawi Temple, Tirta Empul Temple, Jatiluwih Rice Terraces, and Taman Ayun Temple, which definitely determine in the itinerary of Bali tour packages. Mount Agung and Mount Batur, situated in the north-central area of the island and providing crater lakes, rivers, and rainforests, entice tourists for nature-trek. The Bali island actually attracts travelers across the globe for its extended listing of beautiful beaches including names such as Kuta, Sanur, Lovina, Padang Padang, Blue point, Pandawa, Seminyak, Jimbaran, Suluban, Nusa Dua, and Dreamland. Hindu temples of Bali are famous points of interest and resulting from the in-numerous amount of these kinds of temples, it is commonly known as the Island of a Thousand Temples or The Island of The Gods. According to a widespread faith, a majority of these temples are believed to protect the land against the negative powers, appeared to have been set up mainly on watersides or craggy cliffs. Besakih Temple, also widely used by the name of Mother Temple, is a bit more than a thousand years of age. Tanah Lot is the one other primary temple which is built off the coastline of a rock and is an amazing sunset spot. Some other renowned picturesque temples that should be included in the itinerary of a holiday package of Bali are Goa Gajah Temple, Taman Ayun, Alas Kedaton Temple & monkey forest, Pura Ulun Danu Bratan, Tanah Lot Temple, Pura Luhur Batukaru, and much more. You will discover significantly more things to do on the island of Bali instead of taking a day trip to the temples and beaches, such as the popular Balinese spa, the wide variety of water sports activities, and also delightful cuisine. Tourists may experience all the variants of features of the island by picking an appropriate Bali tour packages. 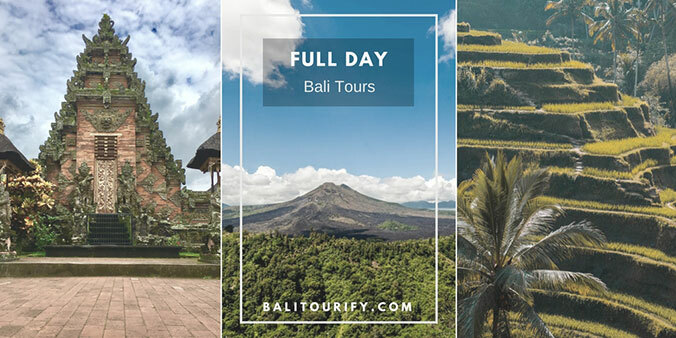 Below is the selection of the best Bali tour packages from Balitourify.com, these types of day tour activities have their particular itineraries to discover the stunning places in Bali. All day trips from Balitourify are accompanied by our friendly and professional English speaking private Bali tour driver. Bali Full Day Tour Packages are a diverse day tour itinerary to visit the fascinating sights on the island of Bali with an array of time 10 hours or 11 hours. Mostly the journey of Bali Full Day Tour Packages covering the spots in East Bali such as Karangasem, Kertagosa, Besakih Temple, Kintamani Bali Volcano, Tirta Gangga Water Palace, and others. The destinations in the North Bali such as Singaraja, Lovina, Ulun Danu Beratan Temple, Bedugul, Jatiluwih Rice Terraces, Batukaru Temple and others. Best Bali Kintamani tour package, full day Kintamani Volcano Tour itinerary to experience a beautiful view of Bali Volcano (Mount Batur) & Lake Batur. Full day Bali Denpasar City - Uluwatu Temple tour, one-day trip itinerary exploring Bali capital city and watch the Kecak dance & sunset in Uluwatu Bali. 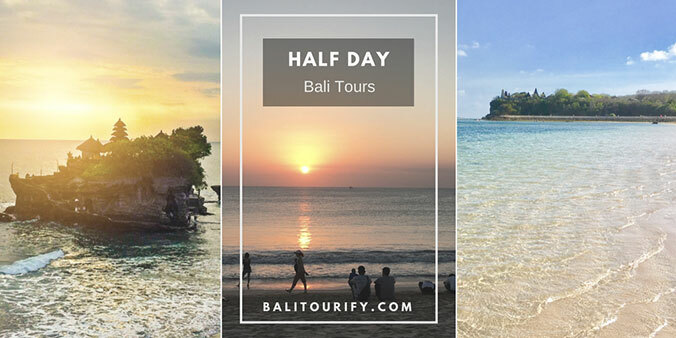 Bali Half Day Tour Packages are a varied day tour itinerary to go to see the enjoyable points of interest in Bali island with an array of time 5 hours or 6 hours. Mainly the excursion of Bali Half Day Tour Packages covering the locations in the central part and the South part of the island such as Gianyar, Ubud, Denpasar City, Uluwatu, Jimbaran, Nusa Dua, Tabanan, Tanah Lot, and others. This is generally the most booked tour packages as it requires merely a couple hours or short day to explore the wonderful things on the island. Ubud half day tour package, the top things to do in Ubud in a half-day trip itinerary. Bali driver hire to see the best places in Ubud Bali Indonesia. Bali Temple Uluwatu morning tours package, half-day Uluwatu tour itinerary. Bali driver hire for 5 hours - 6 hours to visit Uluwatu Bali (sea temple). The best Tanah Lot half day trip itinerary, Bali Tanah Lot sunset tour package, experience a beautiful sundown in Tanah Lot Temple Bali Indonesia. Tanah Lot Temple morning tour package, Bali half-day Tanah Lot tour itinerary. Experience the beauty of Tanah Lot Bali (sea temple) in the morning. Half day Denpasar City tour package, Bali city sightseeing tours itinerary to visit the most popular Denpasar tourist attractions (Bali capital town). Bali Combination Day Tours packages are a variety of day tours package that is a mixture of half day together with one-day tour itinerary. The combination tour packages are also covering the other activities or based on your desired itinerary. A few examples of the collaboration tour such as the Ubud tour with white water rafting activities, the Uluwatu tour with water sports activities, the Ubud tour with spa (massages), etc.